Portugal and Russia met in Moscow for a potential decider about which team gets top spot in the group (thus avoiding the dreaded play-off). Ruben Micael played in what is usually Raúl Meireles' position, while Russia named an expected side, with Dzagoev's absence the only surprise. On a synthetic turf, Portugal faced some initial difficulties trying to knit together a string of passes. 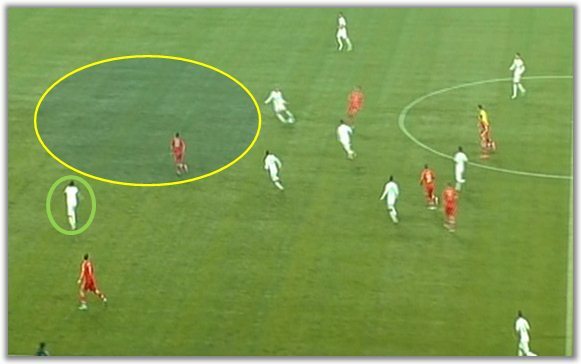 Russia's original plan was very clear: allow the centre-backs time on the ball and pounce whenever the ball got to the midfielders or the full-backs, biting them at the ankles. 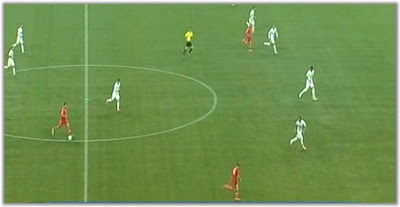 When the ball was sent back to the Portuguese centre-backs or goalkeeper, the Russian players would exert intense pressure. That was the backdrop against which the first and only goal of the match came about. Micael has just been caught out in possession. Pepe (red) realises it and sprints to close the gap. 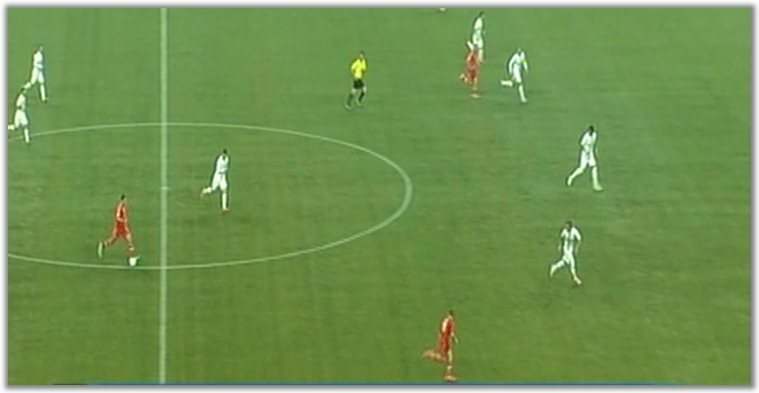 Bruno Alves (green) misreads the whole situation and is late to react. 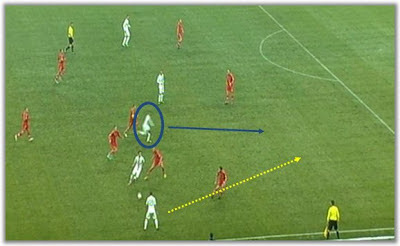 He does not follow Pepe's move and is nowhere near the ideal positioning. 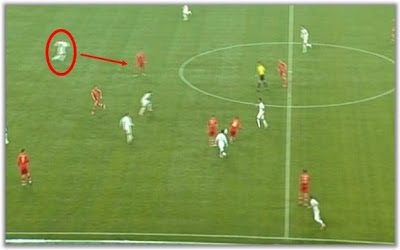 Portugal actually reacted quite well to Russia's goal and managed to find their footing. 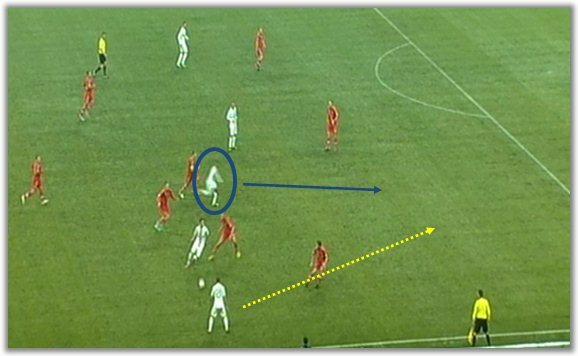 Pressuring high up the field, Paulo Bento's charges managed to win numerous balls back, stifling Russia's initiative. Nevertheless, the Eastern team proved very dangerous whenever they bypassed the Portuguese initial pressure. Micael remained too high up for the most part of the time he was involved in the match and Moutinho was lost as to whether join forces with Micael or help out Miguel Veloso, who was often left stranded. Miguel Veloso was often left to fend off Russian attacks by himself. Russia seemed both happy with the result and confident that their quick transitions would end up punishing Portugal eventually - and therefore dropped back. Nevertheless, their defending was sloppy at best, and Portugal actually managed to create a string of chances through virtually the same play via their 4x3x3 - much like FC Porto versus Paris Saint-Germain - on the right flank (Fábio Coentrão's injury was not exactly a blessing in disguise). Nani (blue) passes the ball to Postiga, who in turns gives it to Pereira. from providing the necessary coverage. and Micael's presence to run into space. 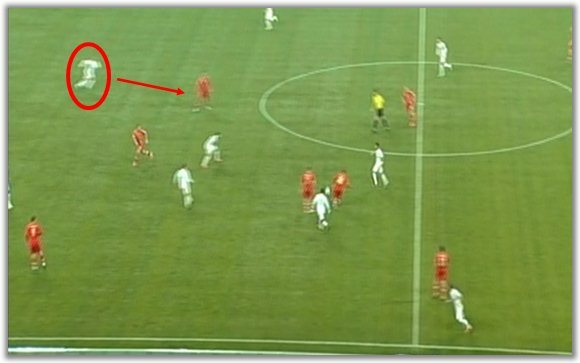 This was relatively easy for Portugal to achieve because both Fayzulin and Shirokov would remain too high up (somewhat similarly to Micael), which meant Bento's men had no trouble finding either Postiga or Ronaldo unchecked in the middle. Despite several opportunities, Portugal's decision-making in the final third was seldom as good as it should have been. To make matters worse for the Portuguese, their effective pressure high up was not combined with effective defending at the back, either derived from individual distractions or from the excessive space allowed after the initial pressure area. Resorting to a familiar strategy, Paulo Bento replaced Ruben Micael with Varela and Portugal were rearranaged in a 4x2x3x1. Moutinho sat closer to Veloso, and Nani shifted to the centre off Postiga. This B plan has yielded its results in the past - against Denmark, for instance -, but this time it was Portugal's final straw. Despite Bento's laudable intent, the midfield became unbalanced and the Selecção were never again able to exert the same pressure or create another scoring chance. Even though this was not Portugal's finest hour, the result may seem a bit harsh, considering the displays from both teams. By half-time, Portugal had had lots more shots, a higher number of passes and a higher percentage of accurate passes - even if their second half was not quite as bright and it was hard to see how Portugal would end up scoring.